A virus is released simultaneously across the globe that reanimates the dead and turns the living into flesh eating zombies. The scientist responsible for developing this has a change of heart (after the damage has happened) and goes to a TV Network to confess. Ex War correspondent Katya, is entrusted to pass on these findings to the general public by live broadcast, however a special agent is in the building trying to hunt her down and stop the broadcast but the dead are taking over, not just in that building or city but the entire world at an alarming rate. Whether or not the truth is revealed.... does it really matter when there is so much carnage? I am almost certain quite a few zombie aficionados will roll their eyes at this but I thought this was a lot of fun for one very simple aspect.....the sheer volume of awesome zombie action!!!! If I could score this on the zombies alone I would give it 5 stars, I loved them that much! 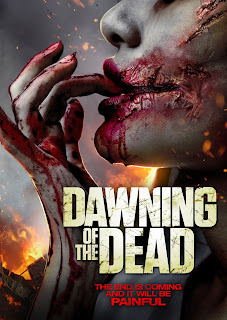 There is a mixture of old school slow zombies and fast rabid ones with great make up and the zombie actors for the most part were awesome and really got into it. Unfortunately it was let down awfully by overuse of CGI but the massive zombie to human ratio did make it bearable. 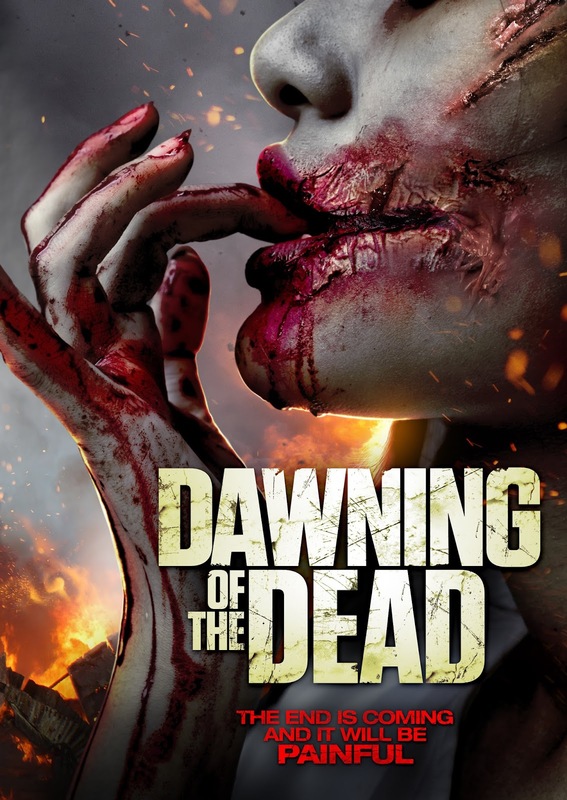 As you'd expect with a name like Dawning Of The Dead it is not particularly original. It is very reminiscent of Romeros Dawn Of The Dead and Snyder's remake almost to the point where you kind of hope Ving Rhames will put in an appearance but it does also pull influences and ideas from other zombie features the main being this films setting that was very similar to the great UK mini series Dead Set, plus a great weapon devised straight out of Braindead. It certainly seems to me to be more in tribute rather then imitation. It is not just based in the TV studio though, there are 3 separate stories going on in the building and to swap between these stories it flicks to news broadcasts across the world of the unfolding zombie apocalypse, these little segway pieces are pretty cool and add to the overall glorious zombieness of it all. The soundtrack is perfectly fine but what let's it down the most is the acting from the living human characters. They are all rather awkward, hammy and seem to be playing a ridiculous game of who can overact the most creating characters you cannot engage with but make for great zombie chow. Don't watch it if you're expecting something different, don't watch it if you're just going to tear it to shreds straight away, I don't believe it totally deserves that bad a reaction. Watch it if you're missing that immersive no brainer total zombie overload. Everyone needs that once in a while. I really enjoyed this and want to see it again.